Enjoy the delicious flavors of a B.L.T. in this pasta salad. Cook pasta in a large pot of boiling, salted water, according to package instructions. Transfer pasta to a bowl of ice water; drain well. Cook bacon in a large nonstick skillet over medium heat until crisp. Drain. Reserve 3 tablespoons bacon drippings; set aside to cool. Whisk together mayonnaise, reserved drippings, shallots, basil, vinegar, and sugar in a large bowl; season with salt and pepper. 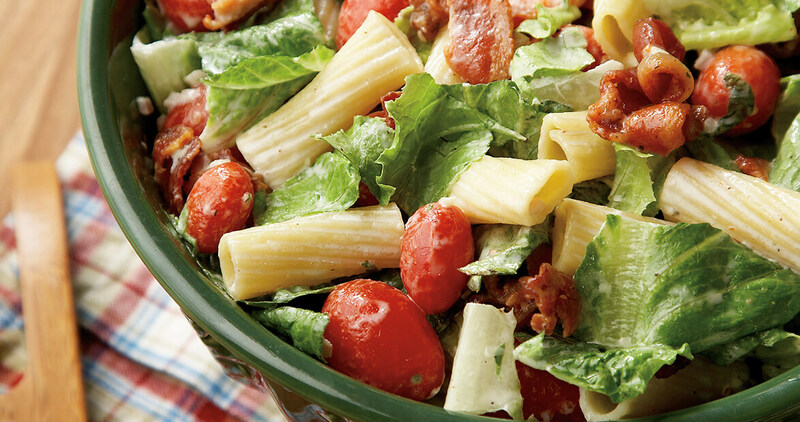 Stir in pasta, romaine lettuce, tomatoes, and bacon; toss to coat. Season salad with salt and pepper.